The baby wailed from her room. Not a cry for help, but the cry of the tired who don’t want to go to sleep, but are too young to understand that’s what they need. I was visiting my daughter. It was an unscheduled visit. I commute home past her house. Most days I think of her and smile as I continue home. Today, I turned in at her street. My car insisted on it. 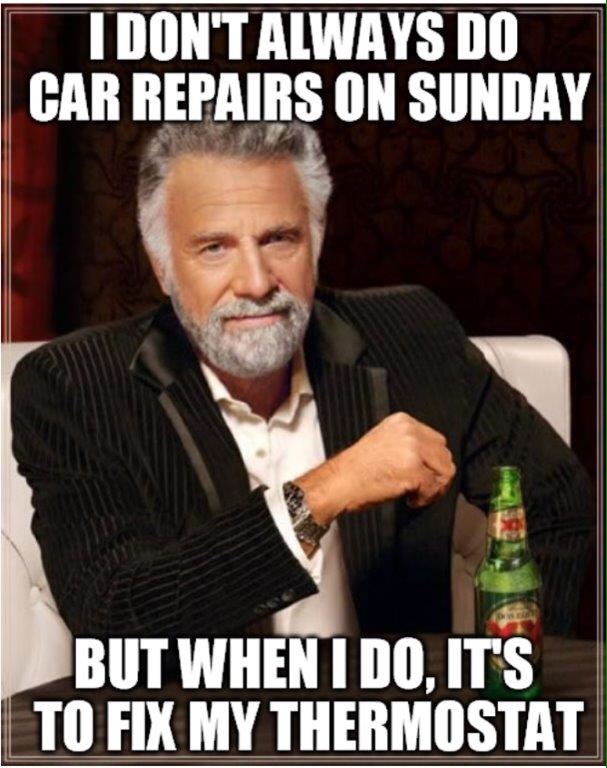 I spent much of last week installing a new water pump in my car. The outside temperatures were in the 30’s. I like working on cars. Doing so in the winter isn’t the most fun. You can see the space heater and the tarp to trap the heat. I put down a piece of carpet to keep my shoes off the freezing concrete. Overall, the process was about what I expect from my skills. There’s a 14 minute video that shows how to replace the water pump. I took three days. 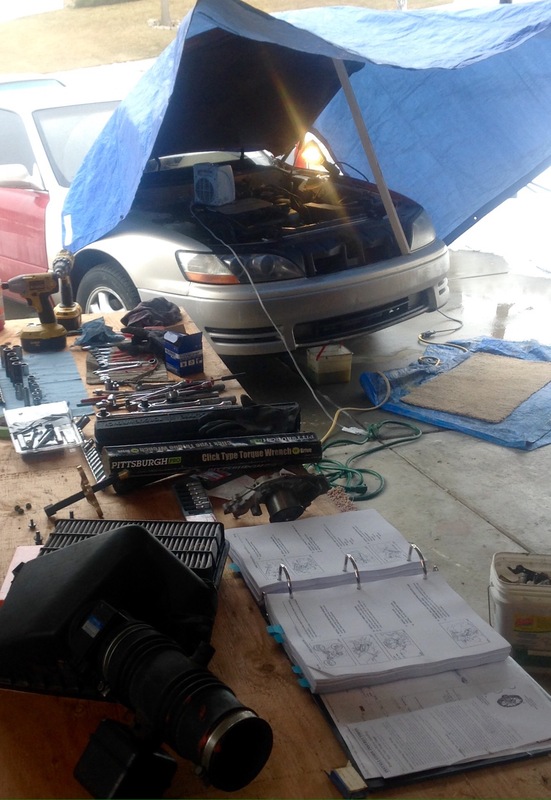 But, eventually the water pump was in and the power steering belt was reinstalled, and the alternator belt, and the timing belt. . three times on the timing belt. And all the covers and brackets. I waited to refill the car with coolant. On Sunday I replaced the thermostat. I might not have had to do the thermostat. But, since I had already drained the coolant, I thought “in for a penny, in for a pound.” I didn’t want to have to drain the fluid again if the thermostat really was the problem. You can test a thermostat. It opens up at about 180 degrees. 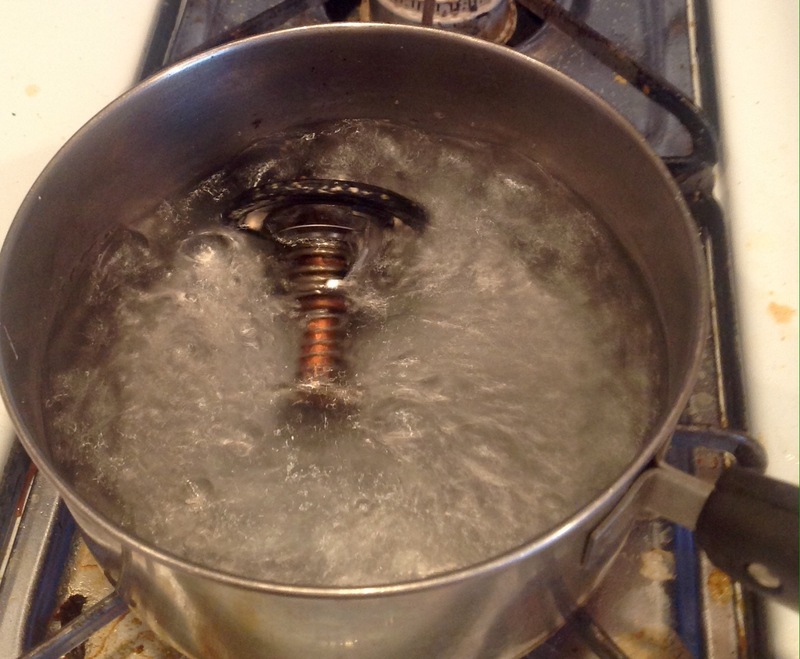 Since water boils at 212 degrees, just cook up some thermostat soup. The old thermostat worked just fine in the boiling test. More evidence that it really was the water pump. 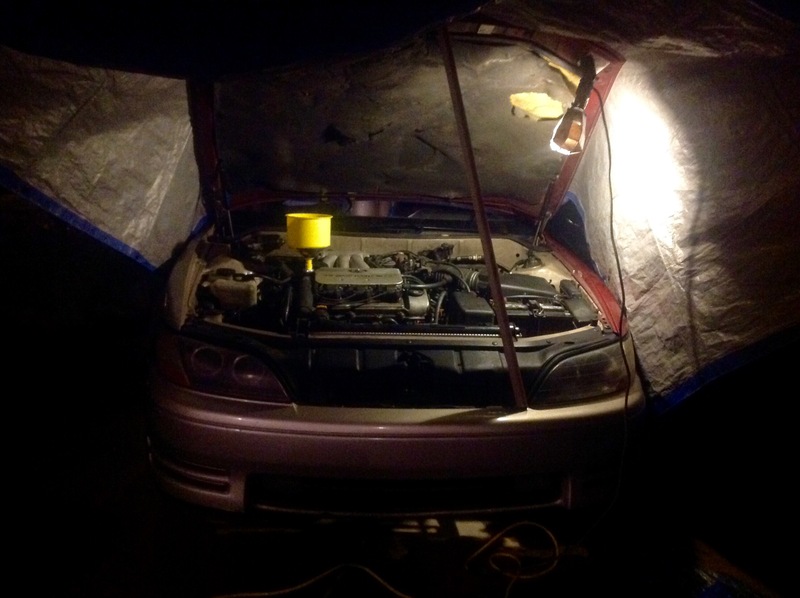 The last step after replacing the thermostat and then refilling the system with antifreeze is to burp the system. I thought about this step as I listened to my granddaughter complain about going to bed. She’s old enough that she doesn’t need to be burped, but when they are small, burping is one of the most frustrating activities imaginable. The baby drinks her bottle just fine. She’s happy. She’s making silly faces as the milk dribbles out of her mouth. She’s adorable. And then. . .she starts to fuss a little. Is she still hungry? More bottle? No? The discomfort continues and if you don’t deal with it, before you know it you have a screaming baby and a very frustrated father. Even when you know that burping is the answer, it’s not always simple to get them to burp. You pat them on the back. You bounce them on your knee. You stand up and “bounce” gently around the room. ANYTHING to get that last little bubble out. Because even a little air will make your car overheat. See that yellow funnel in the picture? It’s called a burping funnel. A car’s coolant system is very much like an infant at feeding time. You can pour in the antifreeze, but if you don’t get the bubbles out, the baby is going to get upset. I know this. I’ve raised 13 kids. I’m GREAT at burping. . them. Last year we replaced the engine in my car. That’s why I even own a burping funnel. I burped. I squeezed the hoses. I waited for the fans to come on. And the baby was happy. . .for a while. Yesterday I drove to work and the temperature gauge was rock solid, right where it was supposed to be. The trip home started well. About 45 minutes into the drive the baby started to get cranky. The temperature gauge started to fluctuate. The heat out of the vents became inconsistent. Apparently, I missed at least one burp. It can’t be the water pump or the thermostat. I mean, new parts never break . . .never mind. It’s probably the burping. My car is named Ironman because of the red and gold coloring, the result of salvaging parts off two cars. The car is 20 years old and has 270,000 miles. It’s a really old baby. Problems are expected. And like a new parent, I’ll keep listening to the little whimpers and occasional tantrums. I just hope the tantrums will remain of the type fixable on a Saturday, preferably when it’s warm.